Toyota iQ (2009-2014) - Car Reliability Index | Reliability Index | How reliable is your car? 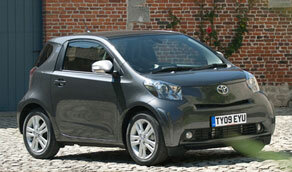 When Toyota launched the iQ it set the cat among the pigeons. Here was a car less than three metres long, which offered the comfort and refinement of something much bigger. However, it wasn't a four-seater whatever Toyota might have claimed, unless two of those passengers are small children. But despite its diminutive proportions, the iQ can carry far more than you'd think, with the rear seat backs tipped forward to increase boot space. Nimble and solidly built, the iQ offers superb urban transport - and in 1.33-litre form it's good on longer journeys too. Impressive for its manoeuvrability, compact dimensions, cabin quality and driving experience, some of the interior plastics should be better, but a five-star Euro NCAP rating and sub-99g/km emissions are further incentives to buy. 1/09 The iQ arrives in 1.0-litre form, with a choice of two trim levels and manual or CVT automatic transmissions. 7/09 A 1.33-litre engine offers a useful performance boost but comes only in range-topping '3' trim. 9/09 Toyota announces a partnership with Aston Martin to create a new luxury city car based on the iQ, called the Cygnet. 7/10 A range of fresh interior finishes and exterior paint colours is introduced; the iQ also becomes Euro 5 compliant. 1/12 There's now a raft of new customisation options. Toyota bills the iQ as a four-seater, but in reality there's only enough space for three - or even two if they're large adults. On fast journeys, disappointingly high fuel consumption can be an issue because you have to use the revs by dropping down a gear or two. The fuel gauge doesn't work in a linear way, with each bar representing a different amount of fuel left. Assume a range of at least 350 miles. Some owners find the headlamps aren't really up to the job; they're fine for urban use, but on fast rural roads they can struggle to light the way. Look for damage to the interior trim caused by the seatbelts; those in the front as well as the ones in the rear can easily get trapped.